Three Cuts: Braves finally break out of RISP rut in desert; more history for Ronald Acuña Jr.
A six-run ninth-inning put the cap on a statement of a series for the Braves against the Diamondbacks. They may have struggled all season long against the National League West -- going a collective 9-18 entering the series in Chase Field -- but the circuit's best road team took the series 3-1, their first series win in the desert since 2012. As the magic number dwindles sits at 16 with Atlanta headed for a three-game series with the Giants, here's a look at the trends and storylines that matter for Braves Country. The first half of the season, no one in the National League was better than the Braves when it came to capitalizing with runners in scoring position. Atlanta's 113 wRC+ in those situations trailed only the Astros (132), Red Sox (130) and Twins (117) before the All-Star break. But since regaining the East lead in the double header with the Marlins on Aug. 13, RISPy business has been risky business for the Braves. 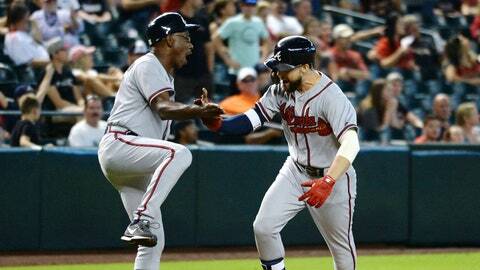 Ender Inciarte broke through with a three-run home run -- which went 433 feet -- in the ninth inning to propel the Braves to a 9-5 win over the Diamondbacks, a blow that couldn't have come at better time. Heading into Sunday, the Braves ranked 22nd in MLB with 85 wRC+ and 23rd in wOBA (.294) with runners at second and/or third in that span. It hasn't truly mattered with the Phillies struggling to string together consecutive wins since Aug. 5 -- doing so twice in going 11-20 -- but it has been concerning from the end of who wasn't delivering when given those opportunities. 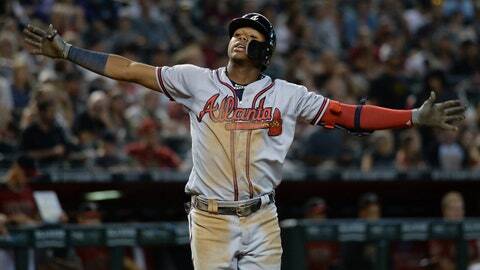 Johan Camargo -- who homered Sunday in the ninth with Ronald Acuña Jr. at third -- has a 202 wRC+ in 36 such plate appearances since Aug. 13, which is the fifth-best mark in the NL. The Braves have also been getting above-average output from Nick Markakis (155 wRC+ in 34 tries), Dansby Swanson (152 wRC+ in his 20 PAs) and Ronald Acuña Jr. (135 wRC+ in 27 chances). But Freddie Freeman (38 wRC+ in 33 PAs), Ozzie Albies (34 percent below average in 30 PAs) and Inciarte (minus-23 wRC+ in 24 PAs before that HR off Brad Boxberger) entered Sunday ranked among the bottom 13 players in MLB in the past month with a minimum of 24 PAs with RISP. 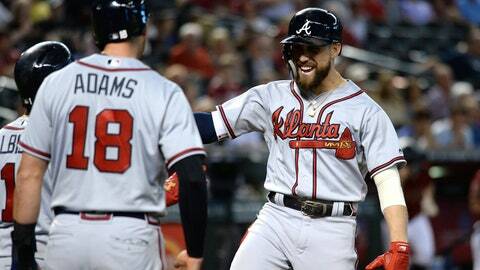 But along with Inciarte, Freeman also rose to the occasion in the eighth inning in Arizona, scoring Acuña with a single. In all, the Braves went 3 for 5 with RISP on Sunday, a vast improvement after going 9 for 35 in the first three games at Chase Field. Atlanta can at least hang its collective hats on performing better in those situations than all three of the NL West's contenders -- the Diamondbacks are at 83 wRC+, the Rockies are at 82 and the Dodgers 77. Sunday may have been a bright moment at the right time as the Braves will now see the Giants, who have a .198 batting average against with runners in scoring position over the past month, the game's fourth-best average in that span. Seemingly, Ronald Acuña Jr.'s every movement leads to another place in history. The 20-year-old add another such instance Sunday as he took the Diamondbacks' Robbie Ray deep in the eighth inning for his 25th homer. That made him just one of 10 players with their rookie status intact to hit 25 HRs in a single campaign before their age 21 seasons, joining a heady list of players in Frank Robinson, Ted Williams, Mike Trout, Orlando Cepeda and Eddie Mathews. That's four Hall of Famers and Trout, who is on a collision course with Cooperstown. With 14 regular-season games remaining and Acuña hitting a home run every 14.3 at-bats, he could wind up with the second-most homers of any rookie before their age 21 season. Trout hit 30 in 2012 and Williams connected for 31 in 1939. Robinson's 38 are the standard, but considering Acuña didn't make his debut until April 25 -- costing him 23 games -- and he missed 29 after the injury in Boston on May 27, a full season would have put him on pace for a record 43 HRs. Aaron Judge (52 last season in 155 games) and Mark McGwire (49 in 1987 in 151 games) had more as rookies, telling you the insane pace that Acuña is on in playing a maximum of 107 games this season. 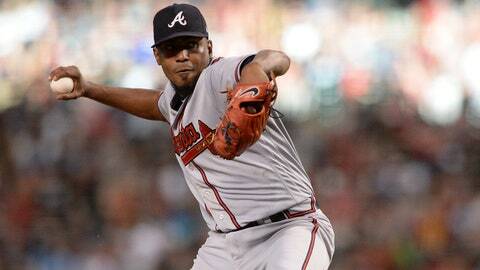 After six innings of one-run ball on Saturday against the Diamondbacks -- a start in which he made history as the ninth player to hit 1,000 strikeouts in a Braves uniform -- Julio Teheran now owns a 2.64 ERA since the beginning of August, which trails only Mike Foltynewicz (2.01) and Kevin Gausman (2.32) among Atlanta starters. The right-hander, who these past two seasons has had the seventh-highest ERA in the NL at home (4.87) and 16th-best on the road, is suddenly delivering no matter the venue. Teheran has a 2.41 ERA away from SunTrust Park, and a 2.81 in Atlanta. He's supplied five quality starts in his last seven outings, and yielded just three home runs in that span after giving up 21 through his first 21 starts. Things are clicking for Teheran at the right time as the Braves continue to try and hold onto the division lead ... and they're likely coming at the perfect time for him as well. In piecing together a potential playoff rotation, Teheran is making a strong case to join Foltynewicz and Gausman instead of Sean Newcomb and his 7.99 ERA since Aug. 12, the surprising Anibal Sanchez (3.28 ERA the last month-plus) or even a youngster like Touki Toussaint. But from a big-picture standpoint, Teheran is also doing his part to either stick in the Braves' long-term plans or give general manager Alex Anthopoulos what manager Brian Snitker likes to call "kind of a good problem." With the parade of young arms -- Toussaint, Mike Soroka, Bryse Wilson, Kolby Allard, and on and on -- along with Foltynewicz, Gausman and Newcomb, Atlanta has options and Teheran has two years of club control at $23 million. The downward spiral Newcomb has been in may help make the case to keep Teheran in the 2019 rotation, but the makeup of that group figures to be among the most intriguing storylines this offseason.